Longshore House is a stone building on 4 floors dating from around 1820. It provides a tranquil environment in a quiet street yet is only minutes away from the centre of Laugharne and its restaurants, pubs and the town shop. The interior is luxuriously appointed with an eclectic mix of modern and traditional fittings and furnishings. There is a South facing garden with seating areas, a gas barbecue and small water feature. With 4 bedrooms (1 en-suite), separate bathroom and wet room, the property accommodates up to 8 in comfort. Children (cot and high-chair available) and (up to 2) dogs are welcome. I and my wife retired to Laugharne in 2009 and through a series of strange circumstances aquired Longshore House about 1 year later. We live only 5 minutes walk away and have the help of a marvellous manager/housekeeper, Lennie, without whom we would never have contemplated running the property. We have 3 Cocker Spaniels who are well known to just about everyone in Laugharne. You will see us walking along the estuary path 2 or 3 times almost every day. Laugharne offers a retreat from the pace of modern life but is less than 20 minutes by car from Carmarthen. The location, on the estuary of the River Taf, has wonderful views and an enchanting atmosphere. Dylan Thomas wrote his best-known works while living here and 'Under Milk Wood' is based on the life and characters of Laugharne. He is buried in the Laugharne churchyard and the Dylan Thomas connection brings in many visitors. There is no beach in Laugharne but 6-mile-long Pendine Sands is about 10 minutes drive away whilst other fine beaches can be found at Saundersfoot and Tenby. St David's, Britain's smallest city and the Westernmost point of Wales, is about an hour away. Longshore House is an historic stone building dating from around 1820, on 4 floors, located minutes away from the town centre in a very quiet steet. The interior was designed by the previous owner, Lesley Taylor, who had her own TV interior design programme. 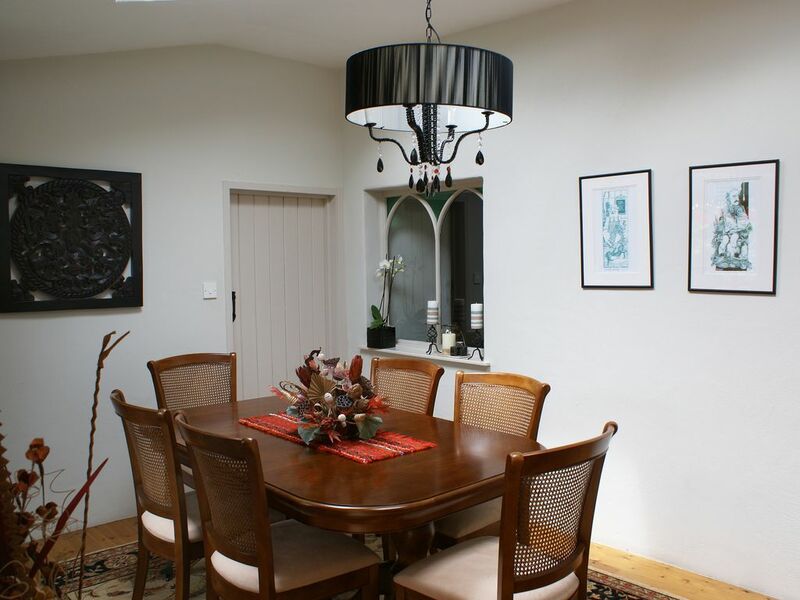 The furniture and fittings are an eclectic mix of traditional and modern. The garden, with views of the castle, faces South and has seating areas, a gas barbeque and a small water feature. All bed-linens and towels (other than beach-towels) are provided and guests can choose between a welcome pack of Champagne or Welsh high tea. A cot and highchair are available and, for older children (and adults!) there is a Wii console in the attic room, which doubles as the 4th bedroom. Dogs are welcome. En suite bath to bedroom 1, separate bathroom with deep bath, shower over, wash basin and WC. Shower room with basin and WC. Luxury soaps and gels provided. Lounge with beamed ceiling, large inglenook with wood burning stove. TV, satellite, DVD player with selection of discs, sound centre pre-loaded with music etc. Wi-fi. Dining room, table seats 8. Luxury kitchen with gas range, dishwasher, fridge/freezer, microwave, espresso machine, toaster, butler sink. Island unit. Granite work surfaces. Full equipped with cutlery, crockery, glassware and cooking utensils. TV. Notes on accommodation: Please contact owner. Outside: The South-facing garden has tables and chairs, a gas barbecue and a small water feature. Utility Room: Washing machine and tumble dryer. Cleaning / Towels / Linen / Maid service: Towels and bedlinen provided, changed weekly (more often by prior arrangement). Other: Conservatory overlooking garden. Great property in the heart of Laugharne, clean tidy and all the amenities you'll need - and a champagne reception!! The house is certainly large enough to accommodate a crowd; the kitchen is extremely well-equipped. Loads of fluffy white towels are provided, as well as high-quality toiletries in the bathrooms. Because there were only two of us staying, we can only comment on the bed on the top floor, which was super-comfortable. The top-floor bathroom was also very luxurious with a huge sunken bath. The staircase from the hall to the first floor is certainly not for the fainthearted! We also wondered whether the L-shaped sofa would provide enough seating for eight people? The little garden was sheltered and sunny, but appeared very neglected and the garden furniture certainly needed a lick of paint. We found the people in the village extremely friendly - check out the Owl & Pussycat café (also extremely dog-friendly!) and Brown's hotel. We are very aware of the state of the garden furniture and are in the process of replacing it - sorry it wasn't delivered before your stay. I'm afraid there is nothing we can do about the staicase - it is a consequence of the age and history of the building and we do our best to make sure guests who may have difficulty with it are made aware of it before they book. Everything was excellent,the pictures do not justify the property!! Laugharne is sitated on the estuary of the river Taf. Beaches nearby include Pendine (10 minutes by car) Saundersfoot and Tenby (25 to 30 minutes by car). Public travel to and from Laugharne is limited and use of a car is highly recommended. Longshore House is in the centre of Laugharne. There is a Post Office/pharmacy and small Spar supermarket which provides most of your day-to-day needs. St Clears (4 miles) and Carmarthen (12 miles) provide a greater choice. Restaurants in Laugharne include The Cors (booking essential), The Portreeve, Seaview and cafes/tearooms. Laugharne was the location featured by Dylan Thomas in 'Under Milk Wood'. The writing shed where he worked and the Boathouse where he lived are both accessible on an estuary-side walk. He is buried in the church graveyard. Booking Notes: Email to make a provisional booking (details below). Completed booking form plus 40% deposit to confirm. Changeover Day: Preferred changeover day is Friday. Normal check-in time 4pm, check-out 10:30am. Short breaks (3 night weekend, 4 night midweek) available outside high season. Notes on prices: Prices are for up to 4 guests. Additional guests (up to 8 in total) are charged at between £60 and £100 each depending on dates. 3 night weekend breaks (Friday, Saturday and Sunday) and 4 night mid-week breaks are available at 60% of the weekly rate other than between 15 July 2016 and 25 August 2016 and over Christmas/New Year. Prices for other start dates and durations available on request.